The foundation stone for the ITER Headquarters was unveiled in Cadarache, France, on 17 November. Financed by F4E and Agence ITER France (as host country), the works consist of the construction of three buildings which will amount to approximately 40 million EUR. Agence ITER France is also responsible for overseeing the contract and construction. The first building will be used to receive the public and will include a conference room seating 50. The building facade will consist of a highly resistant smooth concrete, shaped to produce striking asymmetrical designs. 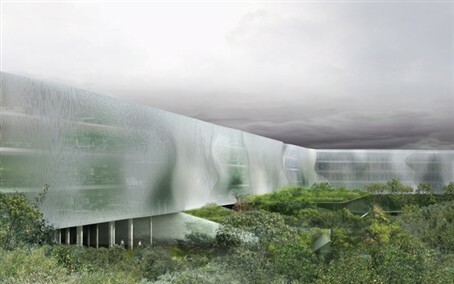 The building will have a green roof to help regulate the temperature inside the building. With a surface area of approximately 20,500m2, the second building will house offices of 460 people, a canteen catering for 1,000 people, a boardroom seating 200 people and an amphitheatre for 500. Planned to measure 160 metres long, 21 metres wide and around 20 metres high, its north-west facade will be shaped like a bird’s wing and will have a shading system composed of 7 centimetre-thick fibre-reinforced concrete slats positioned vertically which will form a protective veil against the wind and will change shape depending on the angle of the viewer, the light or the seasons. The third building will consist of a medical unit and access control. It will take two years to construct these buildings. The foundation work started in September 2010 and the first walls were erected in late October 2010. Construction of the super-structure (floors, pillars, walls, etc.) will continue before the facades and exterior fittings are installed in April 2011. The specialty trades (floor covering, ceilings, walls, locks, etc.) will then follow. Installation of electricity, heating and the lifts should start in November 2011. Prime contractor: A group of architects from the Var Department including Rudy Ricciotti and Laurent Bonhomme, working in partnership with the technical design offices CAP-Ingelec & SNC-Lavalin. Grouping of public works companies: Léon Grosse and Axima. Léon Grosse built the Pavillon Noir auditorium, the TGV train station in Aix-en-Provence, and both the Museum of Natural History and the Orangerie Museum in Paris. Founded in 1881 by Léon Grosse in Aix-les-Bains, it is now one of the most reputed public works companies in France. Workforce: About fifty people in October/November to 200 people during the peak expected in spring 2011. Cost of works: The works, amounting to about 40 million EUR, are financed by F4E and France (as host country).